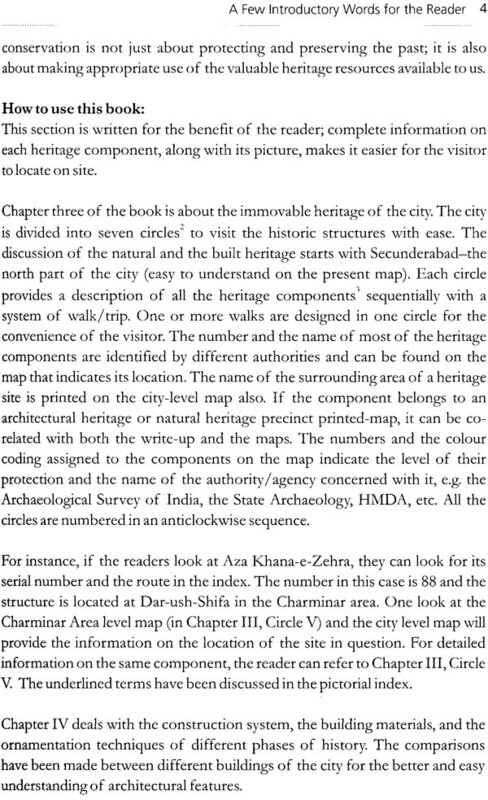 A guide to the Heritage of Hyderabad: The Natural and the Built is a comprehensive understanding of the relationship between the history of Hyderabad and its heritage. 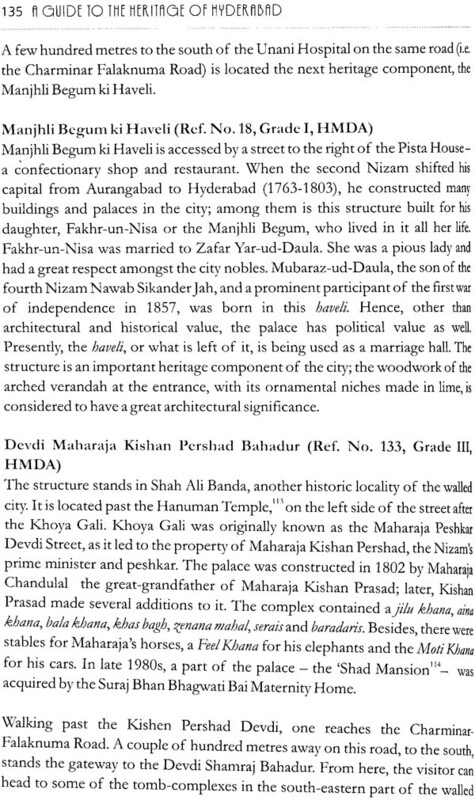 It talks about the significance, the value and the architecture of each heritage structure. 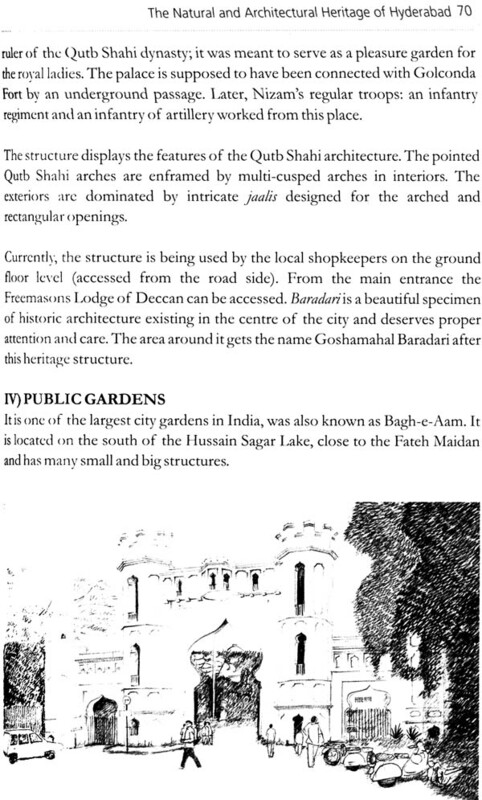 The scaled road maps and the sketches in the book are meant to facilitate visits to different heritage sites of the city. 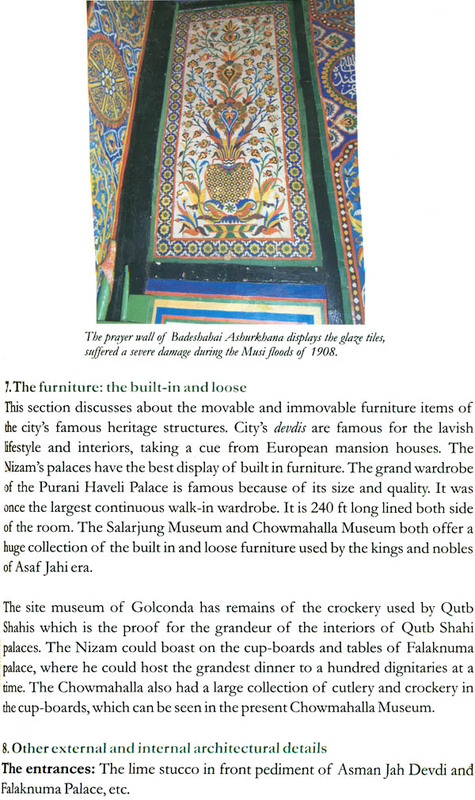 The book captures the city in all its beauty and is a befitting ode to the city and its heritage. To those who have not had the fortune of savouring the sublime splendor of this city until now, this book, is an invitation to do so. 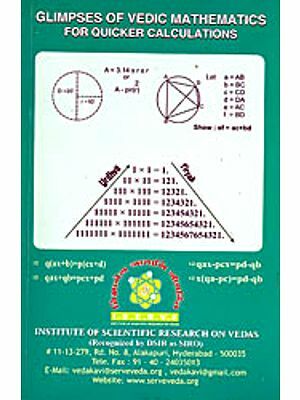 It is a relevant, well- timed and remarkable book-immensely helpful for students, academicians and tourists. Enjoy the grandeur of this historic city! Madhu Vottery is a practicing architect. She was born in Shahjahanpppur, Uttar Pradesh. She has her Bachelor’s degree in Architecture from Government College of Architecture, Lucknow and her Master’s degree in Architectural Conservation from SPA, Delhi. 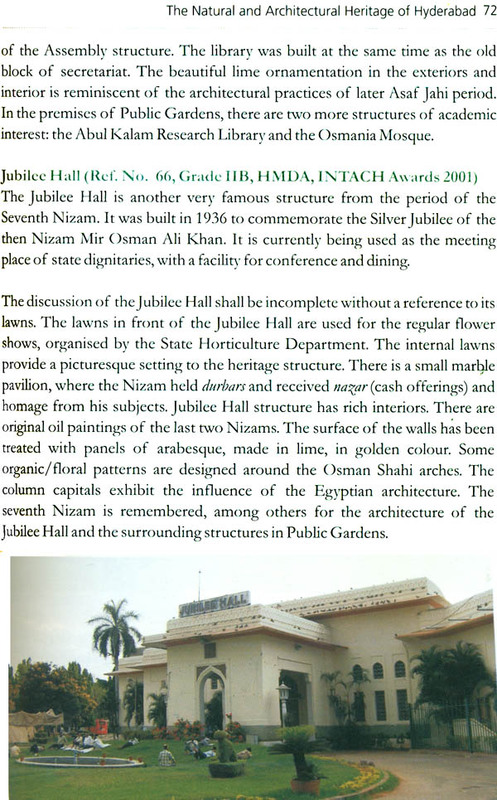 She briefly worked with INTACH (Indian National Trust for Art and Cultural Heritage) in Bangalore. 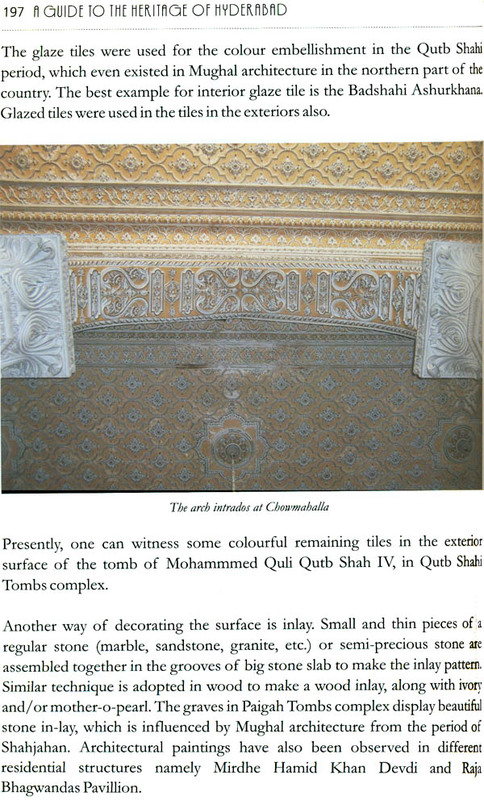 Presently, she is involved in documenting the historic structures of Hyderabad and occasionally introduces them to the visiting tourists. She has presented papers at various seminars. 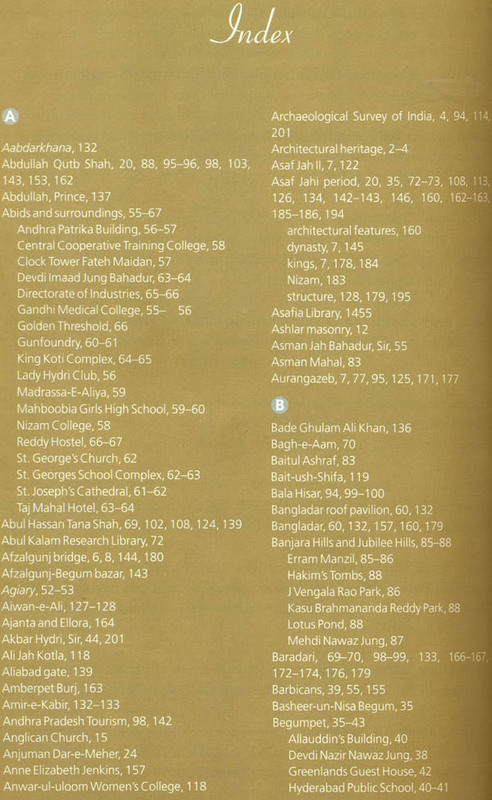 As one of the greatest of India’s historical capitals, with chronological overlays dating back five centuries and more, Hyderabad’s built and natural heritage has been inadequately served with a professional guidebook. 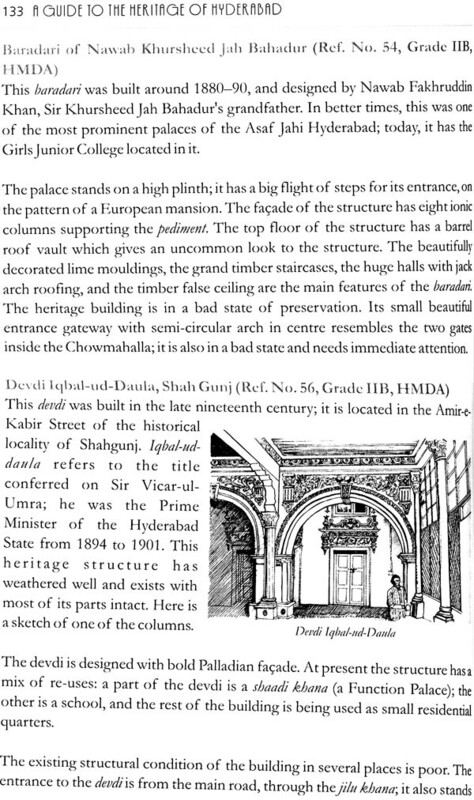 Unlike Delhi and Agra, and even Calcutta (Kolkata) and Bombay (Mumbai), Hyderabad has until recently escaped the attention of architectural historians, in spite of the interest of previous researchers in the monuments of the Qutb Shahi founders of the city. 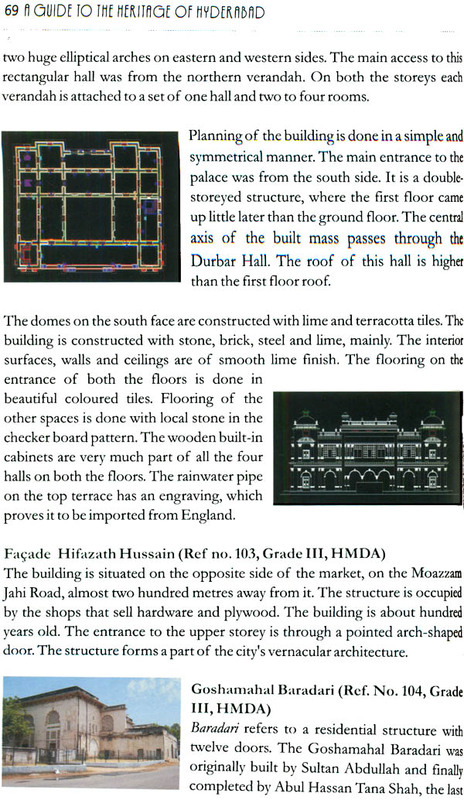 It is a pleasure therefore to welcome this volume, in which is presented for the first time, the entire heritage panorama of Hyderabad’s historical environment, from the mosques, tombs, fortresses and waterworks established by the qutb Shahi sultans and their family members in the 16th and 17th centuries to the palaces, shrines and civic edifices commissioned by the incomparably wealth Nizams and their nobles in the 19th an 20th centuries. 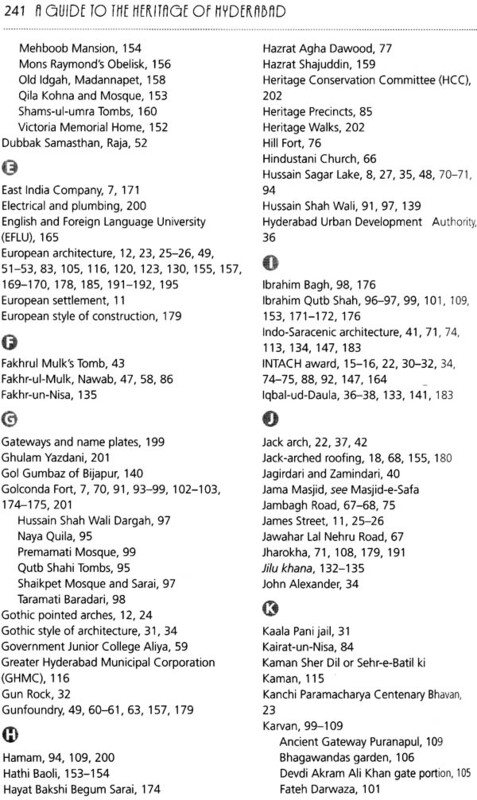 More than 275 such sites and monuments surviving from these different periods in and around the city are described and illustrated in this volume. Nor is this coverage strictly limited to buildings. 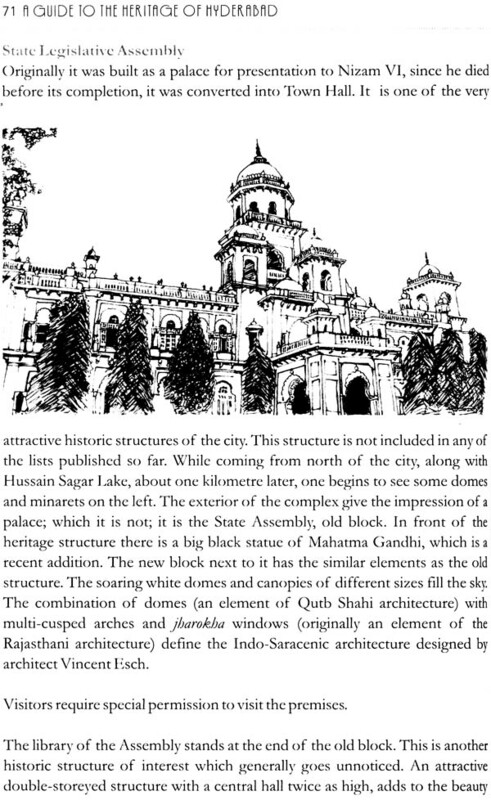 The author is also interested in the natural heritage of Hyderabad, especially the historical gardens, lakes and canals that are still preserved, if only incompletely. 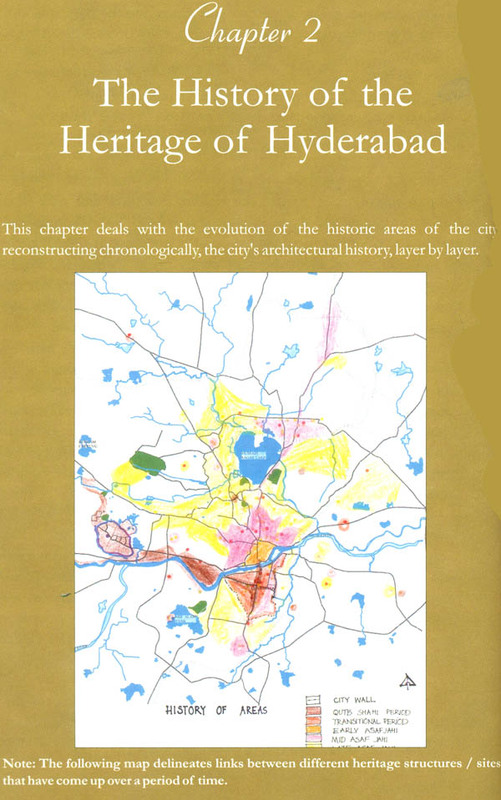 The provision of city maps locating all these different sites, monuments and hydraulic features should prove invaluable, both to those citizens of Hyderabad who wish to be better informed about their own city, and to visitors from elsewhere. The author must be congratulated for assembling such an abundance of diverse data, and organizing them in the most useable manner possible. 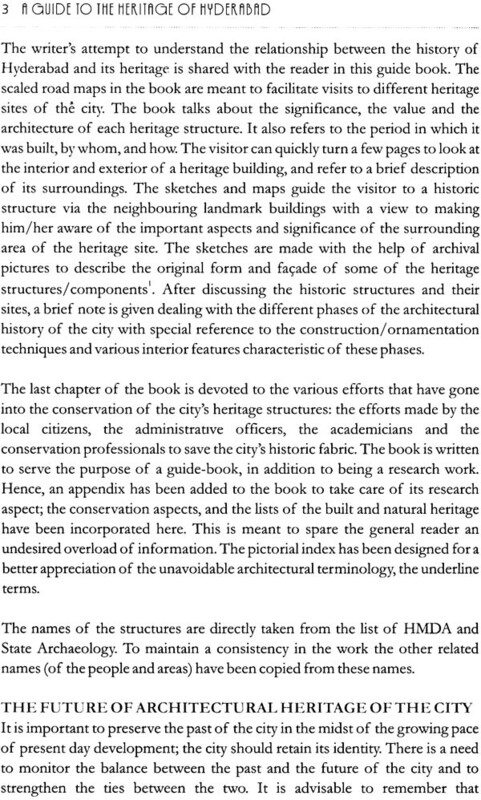 One theme that runs through this volume is the author’s judgment about the present condition and historical value of Hyderabad’s built and natural environment. While she is generous in her appreciative comments of this richly textured heritage, she is critical of the effectiveness of current efforts at conservation. 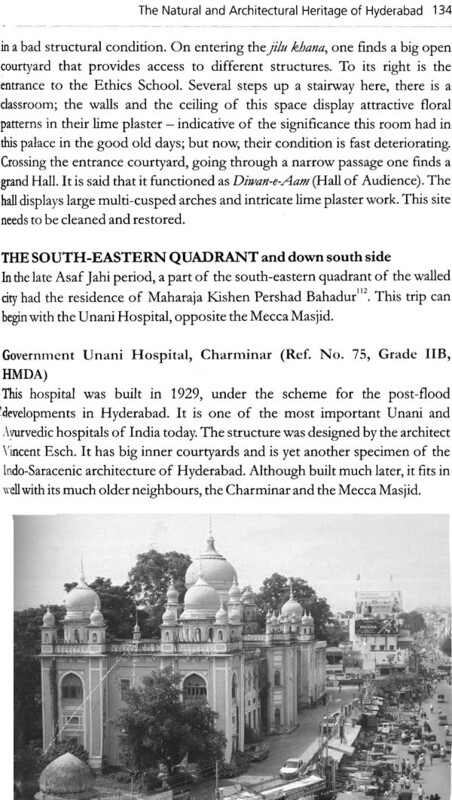 Many of the city’s historical sites and monuments are being subjected to grave danger as Hyderabad undergoes rapid and unbridled development. Such threat remains a serious obstacle to the study and preservation of the built and natural heritage. I hope that this piece of world will provide useful ammunition for the daunting task of shielding sites, monuments and water features from destruction, especially those which until now have not benefited from the protection of civic and archaeological agencies. 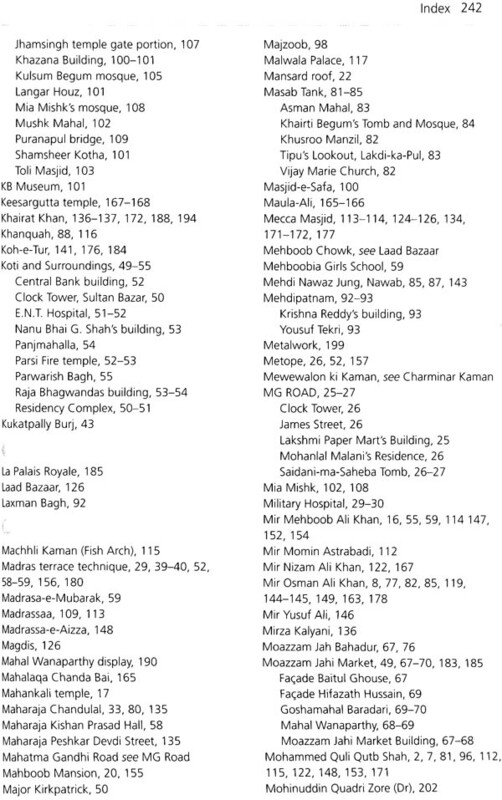 The author has also argued for the appropriate re- use of historical sites and monuments in the city. If guided by enlightened and enforceable policies, there is no reason why such a strategy should not contribute to the preservation of the city’s most significant features for the benefit of future generation. 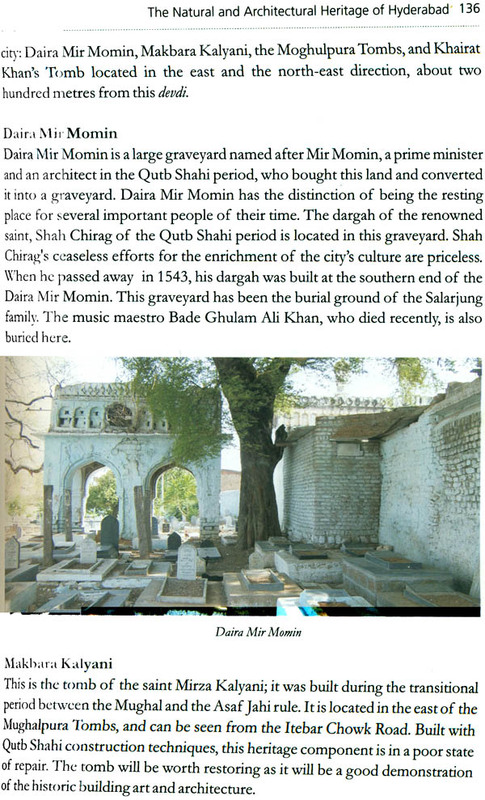 The idea of exploring the field of built- heritage first came to me when I noticed the negligence and gradual demise of many monuments in my home town, the historic city of Shahjanpur, in Uttar Pradesh. I grew up in the neighborhood of mosques, graves, tombs and gateways, visiting heritage components, also reading and discussing about them. My passion for the built heritage has become my profession now, after my Masters in Architectural Conservation. While visiting the different heritage sites in the northern and southern parts of my profession, the idea of documenting the city’s heritage began to take shape. 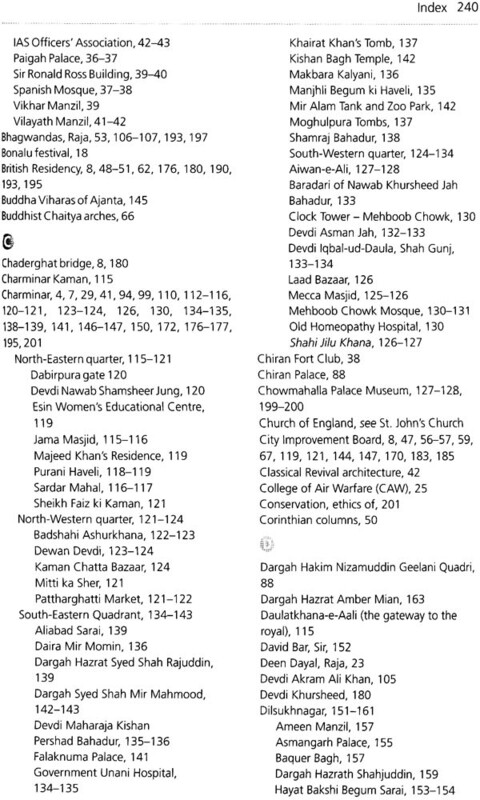 As I went to different heritage sites in Hyderabad, I tried to understand the administrative system of protection of these sites in the city. 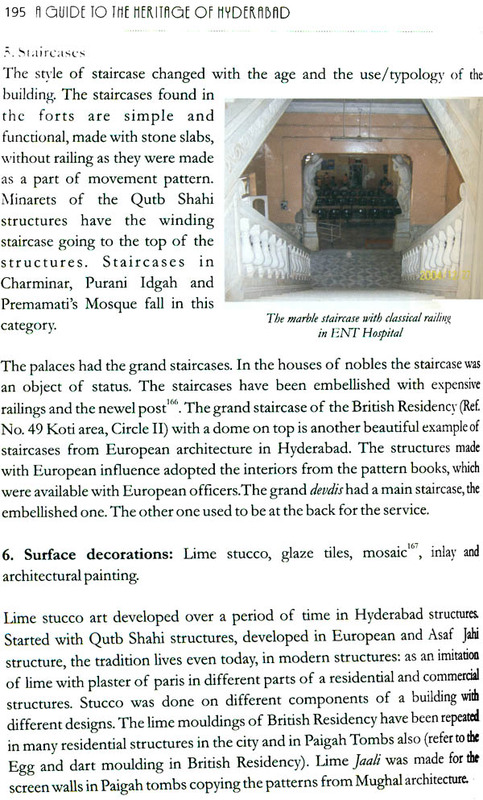 I had some idea of the administrative system of listing and protecting of the heritage at different places in the country; but learning about the administrative system of listing and protection of the heritage in Hyderabad had become a practical experience. The role played in the field of heritage conservation by Government authorities, NGOs, and some individuals is a matter of appreciation. However, there is scope for further improvements in the system. 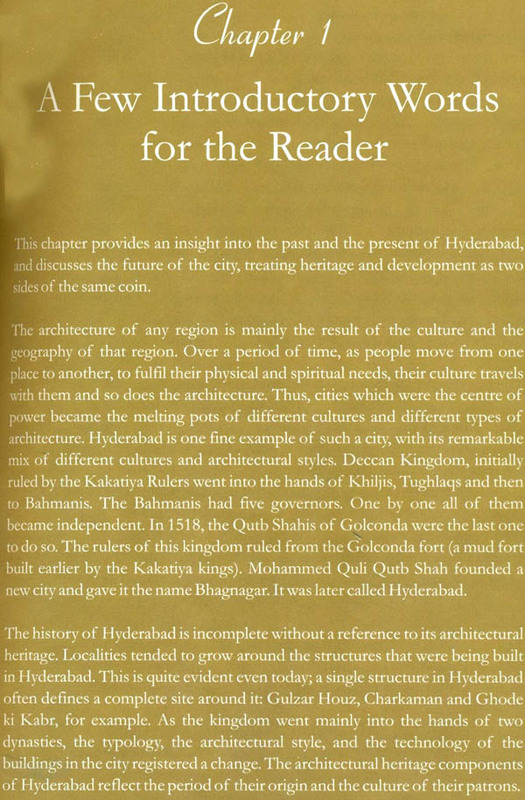 I believe this book will add to the awareness of citizens, tourists and different organizations, and will be of great help to understand the significance of Hyderabad’s heritage, leading to save and maintain it in the best possible way for generations to come.